The Athletic Equipment Including a Health/Impact Sensor™ is a game changing technology now available for sale or licensing. This patent provides methods to acquire, measure, store, and wirelessly transmit physiological and impact data from sensors built into athletic equipment. The primary target market includes youth, amateur, and professional sports organizations and is ideal for football, boxing, MMA, hockey, and soccer. There are no current products that simultaneously monitor an athlete’s vital signs (heart rate, blood pressure, oxygenation) with performance such as the impact of a tackle, the power of a punch and kick, or a blow to the head. Not yet on the market, there are some products that claim to track the force of a punch; however their use is intended for training purposes only. The Athletic Equipment Including a Health/Impact Sensor™ improves upon these ideas by providing training data and in-game data. The NFL teamed up with Zebra Technologies during the 2015 season as “The Official On-Field Player Tracking Provider,” intending to enhance the fan experience through its location tracking technology. 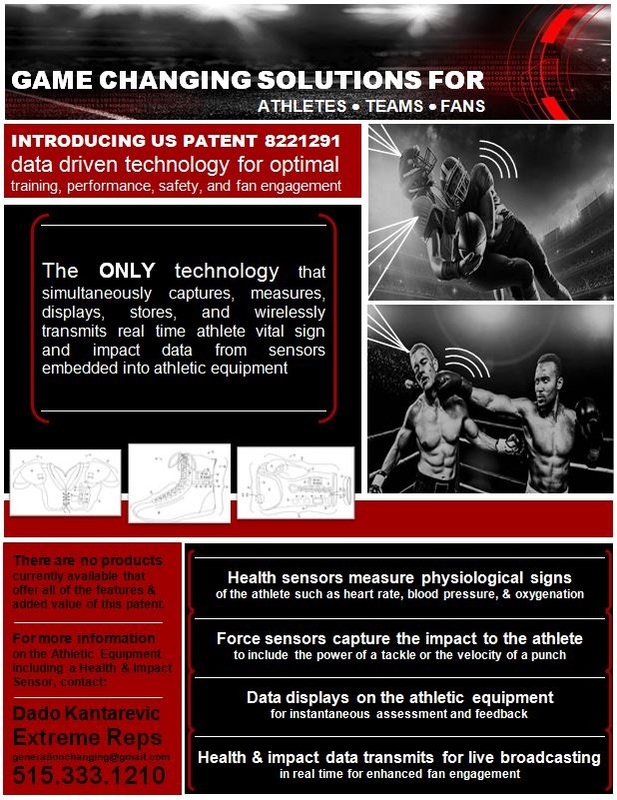 This patent is innovative in that it will further enhance the broadcast experience by providing health and impact data for the fans. Football games will be even more exciting as the fans see the force of a field goal kick, the impact of a tackle or “hit,” or the effectiveness of a block. 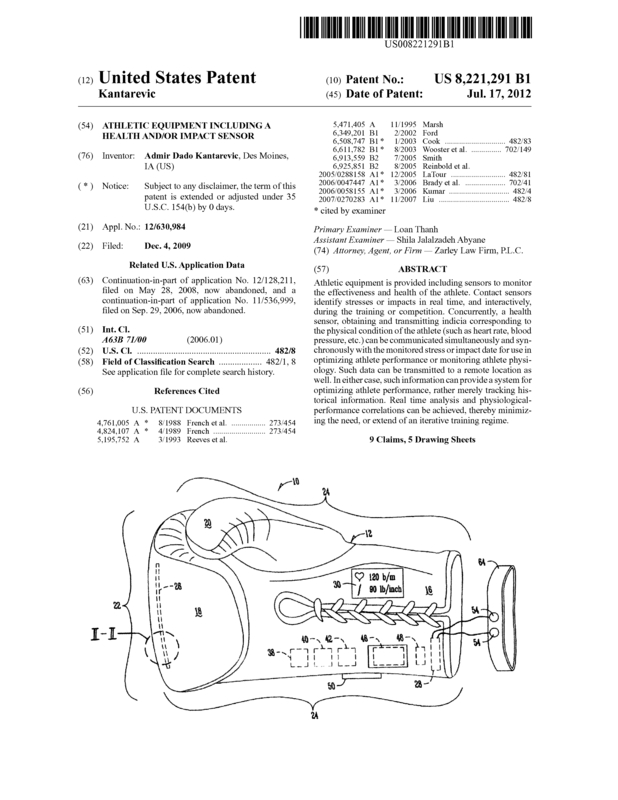 Kantarevic and Associates is looking to for a partnership to license or sell this patent. It is new to the market and has not been previously sold or marketed. In terms of difficulty and expense, there is little research and development needed to achieve a market ready product. This invention clearly and effectively provides sensors for athletic equipment. With the current available technology, manufacturing and practicing this invention is highly feasible without foreseeable difficulties. Several modifications are possible. The margins for profitability are high. The market demand is increasing in the area of sports and wearable "smart" technology. This product is superior with several advantages over existing products, most notably its design ingenuity and its inclusion of the ability to record impacts as well as an athlete’s health/physiologic status. Page created at 2019-04-21 18:30:08, Patent Auction Time.